Huge paper gold sales are driving the gold price down every time it looks like stabilising, but as new physical gold supply moves East, this will surely lead to a massive short squeeze. The statement in the title relates to a frustrated comment in a recent King World News interview with John Hathaway, a renowned gold stocks analyst who manages the well-respected Tocqueville Gold Fund in the USA. Now, this factoid will not be news to regular readers of Mineweb, or to any avid follower of the gold market, and is perhaps indicative of the way virtually all markets are manipulated by the world’s financial elite. In context, Hathaway’s statement in commenting on yet another gold price take-down was as follows: “These guys don’t even have to borrow the gold to sell it. It’s probably a couple of bullion banks, and they use their balance sheets to justify the leverage of selling gold they don’t possess. In some ways this is just a travesty. We have entities moving this major market and making leveraged bets, but they do it without having to take physical possession and short the way you would do it on a normal exchange. So they just wreak havoc in the gold market and damage investor psychology, but it will come to an end. This is a continuing story that has to be watched. Aside from the macro issues that surround gold, I think the chain of custody, the paper trail between derivative paper instruments and the real metal, is of great interest to me” The full interview may be accessed by clicking here. Now what is perhaps unspecified is why? GATA will tell you it’s all part of a global effort, orchestrated by Central Banks, to control (suppress) the gold price. They probably have a point. The same argument could be put as that it is more a universal effort to shore up the U.S. dollar as the collapse of the greenback would throw global trade into disarray. Gold is seen as the bellwether of dollar strength or otherwise. But this is effectively the same argument as that of gold price suppression from a slightly different perspective. But, in terms of gold, the dollar has been deteriorating dramatically over the years anyway. The dollar’s only saving grace is that virtually every other currency against which it is measured has been deteriorating in purchasing power at an equal, or even greater, rate, giving a hugely misleading impression of the dollar’s own intrinsic strength. Or it could just be that some the biggest investment banks and financial institutions have come to realise that gold is nowadays such a small part of the global investment scene that it can be manipulated for their own benefit with total impunity, regardless of the effect it can have on the individual gold investor or fund which looks on gold as a portfolio diversifier. Or it could well be (probably is) a combination of both. The financial elite can thus make obscene amounts of money, while the governments and central banks tacitly collude in turning a blind eye to what might be considered criminal activity in other markets, as it suits their own overall agendas for gold to be kept under control. Consequently the regulators set up to control this kind of activity take little or no interest in investigating the very strange paper precious metals sales, which have been bearing no relation at all to the physical metal supply and demand situation. 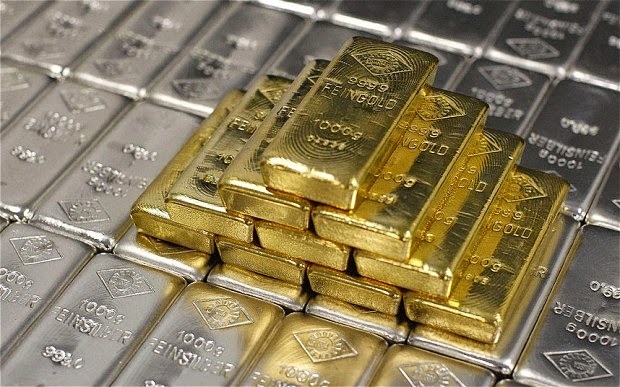 We see and hear major investment banks’ analytical departments talking down gold in the most vehement terms, which because of their status in financial circles leads to massive sales of physical metal from weak holders, aggravated by computer stop loss selling, thus driving the price down dramatically, and then of the same banks climbing back into the market to buy up bullion at far lower prices ahead of a short term recovery. Then rest for a few days, weeks or months and repeat the whole procedure all over again just as the metals seem to be starting to stabilise. This seems to be happening with increasing frequency. What a perfect way to make ridiculous amounts of money for those who have the financial strength to take advantage. Meanwhile, there are the gold believers on the sidelines who may also have virtually unlimited pockets – the Chinese in particular – who must be feeling every day is Christmas as they rake in physical gold at depressed prices, convinced that at some day in the future, by when they will have completely cornered the physical new gold market, the yellow metal’s price will soar, while Western paper gold will become worthless with no physical metal to back it. As far as gold, and almost any other trade goes, the East looks to the long term, the West tends to look to tomorrow! And as for the East cornering the market in physical gold, they are getting awfully close to doing this already. Growing Chinese gold consumption is likely to account for close on 60% of new global gold production this year – and that is on the basis of already pretty well known figures – net Chinese gold imports through Hong Kong plus the country’s own domestic production, are together likely to reach well over 1,500 tonnes in calendar 2013. If, as many surmise, China imports gold also through other ports of entry, which it does not disclose, then this percentage could be higher still. Add into this India’s gold imports which, despite government attempts to control them, some estimate to also be close on reaching 1,000 tonnes this year (particularly if smuggled gold is included), then these two countries alone will together account for nearly all the world’s 2013 newly mined gold supply. And Chinese buying has been growing year on year. Meanwhile a number of other nations, mostly in Asia and the former Soviet union have also been consuming more gold so far in 2013, although none on quite the scale of China and India. This suggests a run on physical gold may well be upon us soon. So far this has been prevented by sales out of the big gold ETFs, and the rundown in COMEX inventories, diminishing scrap sales, plus the supply of any newly mined gold which is not already going directly into Eastern, Middle Eastern and FSU hands. Some think Central Bank gold may also be entering the market. This is most likely to be leased gold and thus due to be returned, so it stays in their books. But as physical gold goes into shorter and shorter supply, this may become increasingly difficult for those who have leased it to repay in kind. Yet another indicator of a likely short squeeze ahead.